Looking for a super comfortable and chair for your home? Look no further! The chair we are sharing today is called Sway and is super comfortable and welcoming. 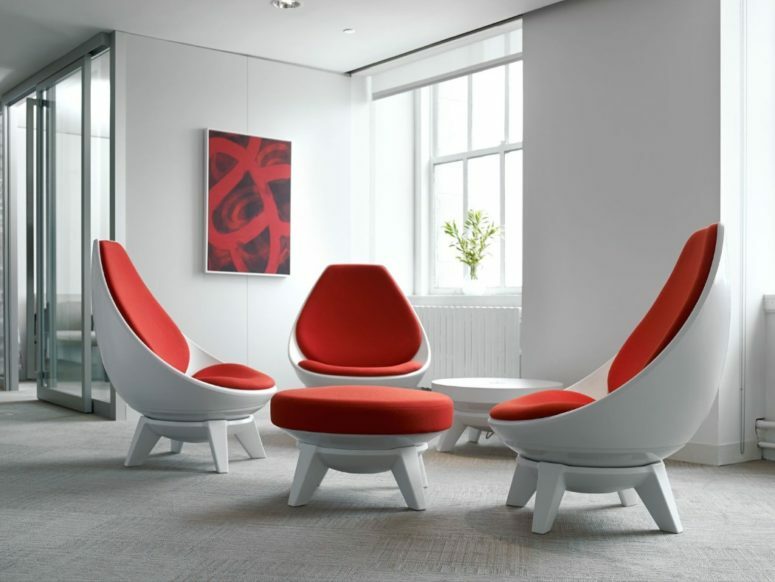 The Sway Chair was designed to be a lounging chair that has the flexibility of perhaps the beanbag, KI’s Sway Chair comes with a hemispherical base that rests on a freely rotating and swiveling base that has 4 legs. The contact points between the seating area and the base have ball bearings concealed within them that allow you to lean forwards, backwards, or even sideways in the chair, choosing a position that’s comfortable for you. With a simple physical action, you can change the chair from a work-chair to a lounger to lean back and relax in. There’s a certain bit of resistance/friction too, which means the chair retains the position you set it in, rather than swinging willy-nilly. It also comes with a rather nifty backrest as well as an adjustable foot-stool! There are several types and colors of upholstery available, choose yours and go!